Staten Island dental techniques and materials have advanced to a point where total and near-total mouth reconstruction is possible right here in the Staten Island area. Unlike conventional removable dentures, extensive mouth reconstruction involves strong, functional and aesthetically pleasing teeth with roots permanently anchored into the jaw bone. You have probably heard around Staten Island about dental implants; the tooth replacement option that is, in most cases, the best possible replacement for a missing tooth. 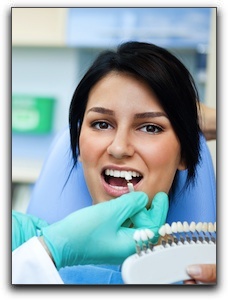 Dental implants have been used in Brooklyn and Manhattan for many years to replace one or two missing teeth. However, they can also provide a structure for dental crowns, bridges, and anchored dentures that replace nearly every tooth in the mouth! ‘Linda’ was a 52 year-old Staten Island patient with a mouthful of problems. She was missing most of her back teeth on both her upper and lower arch. Four of her front teeth were chipped and her gums had eroded revealing the metal bases of two old crowns. To restore a beautiful, strong and youthful-looking smile, she would receive dental implants to anchor partial dentures for her upper and lower back teeth. After soft tissue grafts, her front teeth would receive a combination of porcelain crowns and veneers. The result? A stunning smile, renewed confidence and no more slipping dentures!